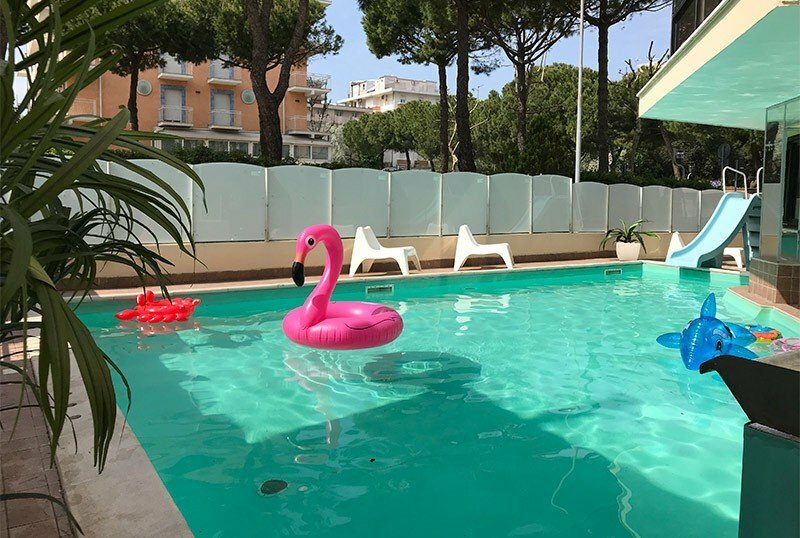 Completely renovated, the Gambrinus Hotel is a 3-star hotel located in Marebello di Rimini with a swimming pool with waterslide and water games, WI-FI throughout the entire hotel, bicycles, parking, children's playground area and numerous services for families . Admits small and medium-sized pets. The hotel is located in Marebello di Rimini, less than a 5-minute walk from the beach. The area is crossed by the bus line n. 11 that connects Rimini and Riccione with frequent trips. All rooms have a balcony, satellite TV, safe, individually controlled air conditioning, telephone, WI-FI, totally renovated bathroom with shower and hairdryer, minibar on request. Some rooms have a balcony with sea view and / or have disabled facilities. STANDARD: they have all the services described above. COMFORT: completely renovated furnishing, available with a small surcharge. Swimming pool with waterslide and water games directly in the hotel, open-air porch and sun terrace, free use of bicycles with child seats, bar, TV, air conditioned restaurant, elevator, taxi service, beach towel on bail and theme nights. Guests can also access the services at the Hotel Jumbo: swimming pool with inflatable waterslide, hydromassages and spa with turkish bath, relaxation area, massages, beauty treatments and solarium UVA. PARKING: guarded and insured, free with the All-inclusive treatment, paid in Basic formula. CONVENTIONS: beach, amusement parks, discos, shuttle service, gymnasium, organized excursions, Eldorado wellness center at the Hotel Jumbo, free entry to the Riccione Beach Village with shuttle included, amusement parks, Marebello water park. PETS: free of charge for small and medium size, except restaurant and pool. BREAKFAST: buffet with sweet and savory products including cakes, yogurt, cereals, meats, cheeses, fruit and eggs. LUNCH AND DINNER: buffet with appetizers, vegetables and side dishes of all kinds, choice of meat and fish dishes, pasta and homemade desserts. It is possible to have lunch delivered at the beach. 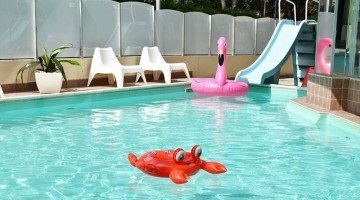 In the hotel: swimming pool with waterslide and water games, playground, baby / mini / junior club, sports tournaments for older children, bicycles with child seats, strollers available, baby sitter service, pediatrician on request. Available at the Jumbo Hotel: mini club and pool activities with inflatable waterslide and trampoline. In the room: camping beds, baby baths. At meals: preparation of vegetable broths, fresh vegetable purée, high chairs, baby menu, bottle warmer, kitchen for parents. On the beach: playground area and entertainment service with baby / mini club. The hotel has a swimming pool with a waterslide and a solarium with sun loungers. Guests can also access the pool of the Hotel Jumbo which is 50 m away where they will find another swimming pool with inflatable waterslide and trampolines. In addition, with the all-inclusive formula will also have access to the affiliated water parks: Acqua-park of Marebello, Splash Rimini and Beach Village Riccione. In the latter, admission is free and unlimited and the shuttle is also free to reach it. 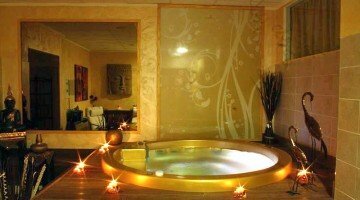 Guests can access the Hotel Jumbo's Eldorado spa with a Turkish bath, relaxation area, hydromassage, color therapy, massages and beauty treatments. The beah affiliated with the hotel, Bradipo Beach, is made up of 4 bathing establishments: Bagno Europa 104 / a, Bagno Luigi 104 / ce Bagno Maurizio 105, Bathroom Bikini 105 / a with gym, playground area, baby toilet with changing table, entertainment and much more. The weekly price list is per person for weekly stays, at least 7 nights a day. The prices of the daily price list are per person per day. Third and fourth adult bed: -20%. - At the time of booking is required to send a deposit and the balance will be made at the hotel during the stay. - Cancellation: The deposit will be returned for rooms that will be canceled one month before arrival; from one month to 10 days from the arrival it can be recovered for another stay within the current season; for cancellations from 1 to 10 days of arrival will be retained as compensation. - In case of early departure, the cost of accommodation only will be applied, up to a maximum of 3 nights, as per current legislation. Offer valid for weekly stays with 2 paying adults in the same room. Super parks offer: 2 tickets for the price of one! FREE children and super discounts for families. All inclusive prices per person with pool and entertainment! Bridge June 2 Rimini, FREE child and park included!